Liquid pouch packaging is a cost-effective and sustainable solution for an individual to larger serving capacities in versatile applications. It reduces the material required in manufacturing, the total shipment weight, and their storage cost. The changing customer lifestyle, shifting towards flexible and convenient packaging has increased the demand for the pouch packages all over Europe. The dairy industry and beverages industry are the ones preferring the most for the manufacturing of liquid pouches, whose demand has increased by 8.2% in 2016 compared to 2015 demand. The total European container and packaging market was USD 205.7 billion in 2016, having an advantageous impact on the Europe liquid pouch packaging market. Replacing all the rigid packaging with the flexible packaging will reduce 77% of the total packaging from entering the waste stream. Goldstein Research analyst forecast the European liquid pouch packaging market size is set to reach USD 2.6 billion by 2024, growing at a CAGR of 5.9% over the forecast years. 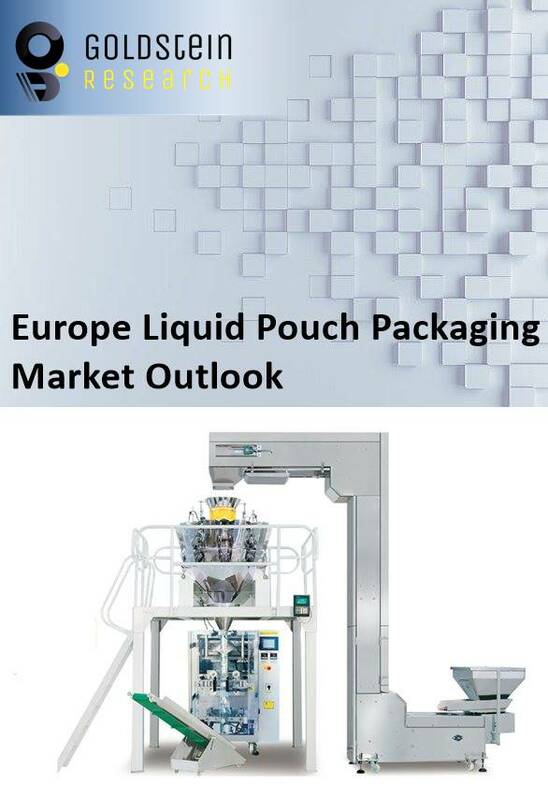 The consumer demand changing in favor of the utilitarian packaging, advertising activities by the companies, innovating liquid pouch packaging machines and other factors will push the Europe liquid pouch packaging market as per the forecast. The report covers the present ground scenario and the future growth prospects of the liquid pouch packaging market for 2016-2024 along with the sales and revenue of the liquid pouch packages. We calculated the market size and revenue share on the basis of revenue generated from the major players across the globe. We have forecast the market on the basis of liquid pouch packages production, price trend, market share and demand and supply chain. On the basis of product, pillow pouch had the largest market share of 23.1% in 2016, which provides the maximum advantage over the usage and handling of the liquid products such as for the dairy products. Spout packages is the fastest growing segment at a rate of 7.4% annually. The making of the spout on a package has decreased the space in use and the comfort in consumption and storage of liquid. Liquid pouch packaging market outlook 2016-2024 has been prepared based on an in-depth market analysis from industry experts. The report covers the competitive landscape and current position of major players in the liquid pouch packaging market. The report also includes Porter's five force model, SWOT analysis, company profiling, business strategies of market players and their business models. Europe liquid pouch packaging market report also recognizes value chain analysis to understand the cost differentiation to provide a competitive advantage to the existing and new entry players. The European trend of the circular economy has an impressive impact on the liquid pouch packaging market. All the plastic waste recycled is transformed into usable plastics that are sent to the packing industries. With the advent of liquid pouch packaging, there is a reduction in the use of other raw materials. The recycled packaging constitutes 90% of the carbon footprint, contributing towards the global sustainable environment. According to the report, major driving factor for the growth of liquid pouch packaging market is the advancement in technological innovations in the packaging industry for the convenience of the consumers. The innovation covers the major areas such as insulation, moisture barriers for short shelf life products, chemical & water resistance, and low thermal conductivity. Further, though liquid pouch packaging is environmentally beneficial yet the major challenge is the raw materials used in the pouch packaging i.e. the polymers being used are environmentally not sustainable and increases the packaging waste that is non-degradable. Thus plastic packaging is facing intense scrutiny along the entire supply chain relating to environmental issues. The presence of raw material, establishment of the packaging industries and quick supply of the products especially the perishable products to the consumers are some of the factors had made the tier-1 countries such as Germany, the U.K., Netherlands, France, and others to contribute 46.8% revenue in 2016 of the total revenue of Europe liquid pouch packaging market. Along with the economic development and advancement in the tier-2 countries, their liquid pouch packaging market is growing at a rate of 5.3% annually. Europe liquid pouch packaging market report comprises of the following companies as the key players in the liquid pouch packaging market: Tetra Pak GmbH & Co. KG., DOW Chemical Company, Weyerhaeuser Products Limited, Smurfit Kappa, Mondi PLC, Bischof + Klein International, Bemis, Ampac. What is the revenue of liquid pouch packaging market in 2015-16 and what would be the expected demand over the forecasted period?